We work in partnership with lots of different organisations to nurture and develop ambitious new outdoor work. Since 2007 we have commissioned and supported more than 100 new outdoor projects, many of which have toured widely in the UK and internationally and we have delivered these projects in partnership with lots of different co-commissioners and partners. Information about how to work with us as a co-commissioner can be found here. In commissioning new work, individual consortium members act as pro-active producers of new work, in collaboration with other consortium members. We nurture and develop new ideas and proposals with artists who can deliver our strategic objectives. As part of this process, members will sometimes propose artists to the consortium based on their knowledge of an artist’s work. All consortium members attend a range of events, festivals and gatherings through which they are introduced to a range of new and established artists. In selecting work for Without Walls support we are looking for exciting and ambitious new work of all genres and scales by UK artists, that are suitable for presentation at a range of outdoor festivals in the UK and beyond. We are looking to develop work with artists who seek to tour the piece widely, ideally over a number of years. 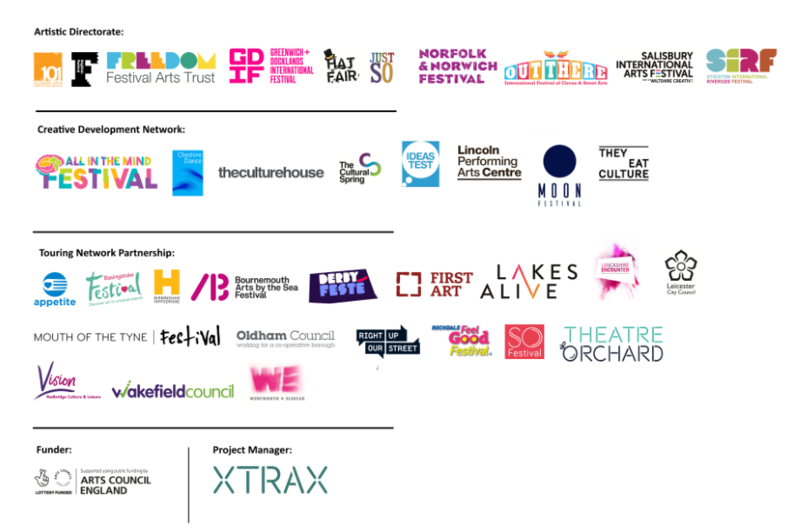 We commission work by investing development funds in selected projects, and we also support selected work that we have not commissioned to tour our network of festivals. We encourage artists to seek other commissioning partnerships outside of the Without Walls network and will do our best to support artists to create commission relationships. Important note – Without Walls is supported by Grants for the Arts and therefore we are unable to commission projects that are also supported by Grants for the Arts; Grants for Arts funding can not be used as match funding to Without Walls and vice versa. 1. Respond to an open call. These opportunities will be announced via our mailing list, website and social media channels – Facebook & Twitter. 2. Contact any of the member Festival Directors directly to discuss the idea and assess the suitability for inclusion in the programme. All artists wishing to make contact with the consortium should read the artistic policy and refer to the Programme Archive for information about previous projects that we have supported. Also, please remember to invite us to see your shows – this is usually the best way for us to judge whether we may want to develop a project with you.